David Smith, Managing Partner of category sponsor Henderson Loggie, and host Fred MacAulay with the Byron team - Ronnie Marshall, Megan Paterson and Jill Graham. Pic: Kenny Smith. A leading Kirkcaldy hairdresser has picked up another major award. 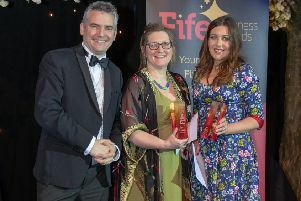 Byron Hairdressing triumphed at the 2019 Fife Business Awards, held at Rothes Halls, Glenrothes, last week. It was one of 12 category winners. Byron, based in Alexandra Street, won the ‘Excellence In People Development’ (up to 20 employees) category which was sponsored by Henderson Loggie. The judges praised the business for going beyond product knowledge to ensure its staff were the best they could be. They said: “Byron has a comprehensive programme to identify and deliver training and development for the company and staff.